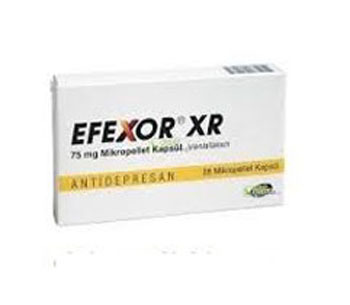 Effexor is one of the most widely used antidepressants. The efficacy and safety of the drug in the treatment of depression have been proven in several double-blind studies. The active substance of the antidepressant is bicyclic antidepressant Venlafaxine. Each Effexor capsule can contain 37.5 mg, 75mg, 100 mgor 150 mg of the active ingredient Venlafaxine. The action mechanism of Effexor is associated with an increase in the activity of the neurotransmitters serotonin, norepinephrine and, to a lesser extent, dopamine in the CNS, which contributes to the effective reduction of depression and anxietysymptoms. Effexor is taken at the dose of one capsule daily, approximately at the same time of the day. Each capsule should be swallowed whole and washed down with a sufficient amount of liquid. The initial dose of Effexor is 37.5 mg per day. This dose is recommended to be takenfor one week. Then, the dose is increased to 75 mg per day. Depending on the clinical response and tolerability, the daily dose can be increased to a maximum of 225 mg (three Effexor 75 mg capsules). The dose should be increasedat the intervals of two or more weeks. The recommended Effexor dose is 75 mg per day. Clinical studies have found that the use of the antidepressant in high doses does not contribute to an improvement in the condition of a patient, who suffers from social phobia. The recommended initial dose of Effexor ranges from 37.5 mg to 75 mg per day. In severe forms of generalized anxiety disorder, the daily dose of Effexor can be increased to 225 mg per day, in some cases up to 350 mg.
Effexor should not be taken concomitantly with MAO inhibitors. It is recommended to start the antidepressant course not earlier than 2 weeks after the end of therapy with MAO inhibitors. Combined use of Effexor with serotonergic drugs (some tricyclic antidepressants, triptans) increases the risk of serotonin syndrome development(a toxic condition, caused by excess serotonin in the CNS). Effexor is usually well tolerated by patients of any age. When the antidepressant is usedat recommended doses, serious side effects develop rarely. The most frequent among the undesirable effects are headache, increased sweating, nausea, and abdominal pain. Although Effexor is not recommended for pediatric patients, the antidepressant can be sometimes used to treat depression in children 6 years and olderafter a thorough assessment of the risk-benefit ratio. In some cases (for example, with difficulty swallowing) the contents of the capsule can be mixed with a small amount of apple juice. The resulting solution must be taken immediately. It is recommended to continue Effexor course for at least 6 months after the remissiononset. Complete abolition of the antidepressant is preceded by a gradual reduction in dosage. This will help avoid the withdrawal syndrome.